the sound of air passing in and out of the lungs, as heard with a stethoscope. 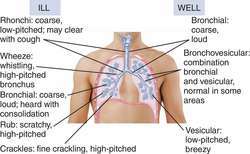 Vesicular, bronchovesicular, and bronchial breath sounds are normal. Decreased breath sounds may indicate an obstruction of an airway, collapse of a portion or all of a lung, thickening of the pleurae of the lungs, emphysema, or other chronic obstructive pulmonary disease. Also occur with frail clients who are not physically able to breathe deeply. Any sound of pulmonary origin which is heard by the unaided ear—e.g., gasp of joy or dismay, death rattles—or by placing a stethoscope on the chest wall. Presence of bronchial breath sound as a sign of consolidation found to be persisted even after antipseudomonal antibiotics. The examiner also should note the timing of any abnormal breath sound or when the sound occurs in the respiratory cycle. Osage County First Grade enjoys Seals, Sea Gulls and other Sounds beginning on the first day of school as I introduce the letter c and read Chair CH CH CH a breath sound. 7%) and decreased breath sound was the main sign on presentation (88. 1) Abnormal breath sound, number (%) 9(8) Fever for consecutive days, number (%) 9(8) Presence of cough, number (%) 15 (13. We recorded the tracheal breath sound in supine and upright positions during nose and mouth breathing," said Dr. These human patient simulators have a full set of vital sign: heart sounds, breath sound, mouth sounds, pupillary reactions They breathe, they talk, their eyes are open, their level of consciousness changes. Since the first phoneme of the next word is predictable from the breath sound, this rules out any word not starting with that phoneme, and so the listener's search space is reduced by about 98 percent. By the time the students have built a vocabulary of 15 gestures, they might add a word on count 4, a breath sound on 7, a laugh on 12, and a whistling sound on 13. This unique capability is facilitated by a proprietary noninvasive piezoelectric sensor array that enables detection, through sensitive breath sound analysis, of respiratory wheezing (stridor).